Are you looking for Florida flight prices? Fares are released 11 months prior to departure, but we already have advance fares for March 2021 Florida Flights. Call us on 01934 319 851 for more information. Or fill out an enquiry form for an email quote. Can you depart early March? The airlines run a winter season until around mid-March. Direct flights from Manchester or Gatwick are excellent value. Planning to leave mid-March? Fares creep up as we approach Easter. For best value, book a mid-week flight in advance. Need to leave late March? Schools start to break up for Easter and prices increase dramatically. If you’re restricted to school holiday dates, Heathrow’s indirect flights are the most economical choice. Book early for peak dates. For additional savings, avoid the weekends. Tuesday and Wednesday departures offer the best-value flights. How much do you expect to pay for March 2021 Florida flights? Don’t be surprised to see High Street prices over £595pp. Book a mid-week departure in advance for significant savings. Our prices start at £390 per adult and £315 per child. We book with the best. BA, Virgin, United and Norwegian all provide an excellent service. But you needn’t pay a fortune. Book in advance and we’ll monitor prices on your behalf. As soon as we can achieve the best fare, we snap up the seats. Early bookers are first in the queue, so don’t delay – especially if you need late March flights. Manchester and Gatwick offer direct flights throughout the month. To save money, aim to leave early March. If possible, fly mid-week (weekend flights incur an additional charge). On busy Easter dates, Heathrow’s indirect schedule is the most economical choice. Flights change in Washington or Atlanta, where you’ll clear customs. The stop adds a few hours to the journey, but the savings are significant. We also book connecting flights from smaller UK airports. Exeter, Aberdeen, Inverness, Glasgow, Edinburgh, Newquay, Isle of Man, Jersey and Belfast all have convenient timings. Your luggage is automatically checked through to Orlando. Most flights arrive at Orlando International. 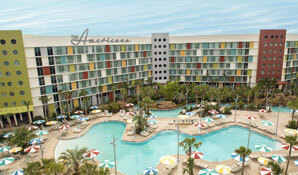 Its central location is ideal for Florida’s main attractions. If you’re planning a coastal holiday, Miami, Tampa or Fort Myers may be more convenient. Let us know your requirements or call us on 01934 319 851 to discuss options. Book your March 2021 Florida flights today with a deposit of £100 per person. When seats are released we monitor prices daily until we can achieve the best fare. Advance bookers are first in the queue when prices drop – so don’t wait. We also book hotels, villas, townhouses and car-hire. If you’re looking for a complete holiday package, get in touch. We can even add attraction tickets to your booking. Call Alex on 01934 319 851 for more information. All our March 2021 Florida flights and holidays are ABTA and ATOL protected. Fly direct to Orlando from Gatwick or Manchester. Grab the keys to your hire car and head over to Universal's Cabana Bay Beach Resort. Stay for two weeks at the retro 50s-themed hotel. Families will love the swimming pools, water slide and bowling alley. Orlando's top attractions are all nearby. This holiday is available from £995 per person. Book in advance now!